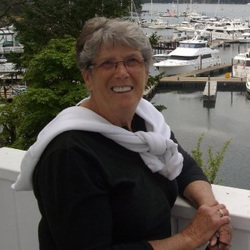 With both sorrow and joy, we at Love INC, acknowledge the passing of our beloved Pat Brown, Love INC Board Member, Secretary, and Volunteer extraordinaire. Pat went home to be with the Lord on July 21, 2012, after a short battle with cancer. Blessed with the heart of a servant, Pat was always willing to step in and help wherever she was needed. Let us count the ways! > Not only did Pat embrace the Love INC vision, she recruited half our new volunteers! > Oh, how wonderful Pat was with our clients on the phone – and praying with and for them! > What a tremendous “people person” – with a ready, infectious smile! For me, personally, Pat was a great encouragement and blessing. I was always convinced that it would take at least! 7 volunteers to take her place!! Pat Brown showed us all how to live and how to die – truly an example of a Proverbs 31 modern woman. She IS greatly missed, but I am confident Pat is “leaping and dancing” before the Lord! "Mozzie" moved from Africa to Hillsboro several months ago to attend school. Although she is living with a friend, she is still struggling to make ends meet. "Mozzie" is 8 months pregnant. She called Love INC asking for help for her baby. Love INC was able to offer a hand-up to "Mozzie". Ascension Presbyterian Church provided a new Pack 'n' Play for her baby to use as a crib and the "Love Bugs" Gap Ministry of Singing Hills Christian Church will provide clothing, diapers, wipes, and toys for this precious child that will be born this month (May). Recently, "Mozzie" left a message on the Love INC answering machine: "Thank you so much! Thanks to Love in the Name of Christ! I am so happy... Thank you and God bless you!" Please join us as we continue to pray for this brave young woman; pray that we will be able to continue to support her and point her to Jesus. “It’s time to get my life in order,” admitted 'Cathy', who recently moved to Hillsboro with her 14 year old son. 'Cathy' was transitioning from a single, rented room to a small apartment and was in need of “just about everything.” After verifying the need, Love INC stepped in to offer a hand up. 'Cathy' received an appointment at Harvest Home, a Love INC Gap Ministry. Three friendly volunteers were able to help 'Cathy' choose many household items for her new apartment, including pots and pans, dishes, glasses, silverware, sheets, blankets, pillows, bedspread, and much more to help transform her little apartment into a home for herself and her son. Additionally, these volunteers were able to spend time getting to know 'Cathy'. "Gap Ministries provide an opportunity to help build a relationship with our clients which is just as important as meeting the physical needs," said Carol Shafer, Executive Director. Next, 'Cathy' will be referred to our Bed Gap and will receive a mattress, box spring, and a bed frame. Volunteers fromThe Table - West will deliver these much needed items to her apartment, providing another opportunity to connect with her and share the love of Jesus. Another need that 'Cathy' mentioned was for non-food essentials that are not readily available in our community. At this time, we do not have a resource for cleaning supplies, paper supplies, and other items that are much needed by our clients; however, God has raised up a church, Hillsboro First Baptist, who is willing to fill this 'gap'. That ministry will open soon, and we will be able to offer these non-food items to 'Cathy' and others who need them. ONE MOTHER'S STORY - Isn't it AMAZING what can be accomplished when God's people work together! Early in March, our Love INC Clearinghouse received a call from a young mother seeking assistance. She had recently been accepted into a local recovery program for getting off methamphetamines. She and her husband were both addicts and when she decided to clean up her life, he became violent, breaking and destroying many of their household items. She separated from him and is dedicated to moving forward with a clean and healthy lifestyle. Through our church partners and Love INC Gap Ministries, we have been able to help her. •	First, she was referred to Harvest Home Ministry at Harvest Community Church, where she received towels, dishes, utensils, glasses, linens, and a selection of other household items. •	Next, she was met by our representative at Singing Hills Christian Church, where the Love Bug Children’s Ministry has just started serving clients. There, she received a new Pak-N-Play Crib (donated by Ascension Presbyterian Church), a good used stroller, children’s clothing, diapers, and wipes. •	In a few days, she will be receiving a queen size box spring and mattress, delivered by our Love INC Bed Gap Ministry, staffed by volunteers from The Table – West (Church). This sweet-natured young woman has been extremely appreciative of the help she has received from Love INC, thanking us over and over. Our staff and volunteers at the Clearinghouse will pray for her each week as she continues her journey. ISN’T IT AMAZING WHAT CAN BE ACCOMPLISHED WHEN GOD’S PEOPLE WORK TOGETHER! Grant heard about Love INC through his church, Calvary Chapel Worship Center. He has been volunteering with Love INC of Greater Hillsboro on Tuesdays and Thursdays since early December. From the day he started, Grant has been willing to do any job requested of him, serving as receptionist, cleaning and maintenance man, telephone intake volunteer, and now helping deliver beds to clients. Grant is an excellent telephone intake volunteer, because he communicates well and has a heart of true compassion for people. He’s great at listening, hearing what people are saying, expressing empathy for how difficult their situation must be, and praying for them over the telephone. He’s a 'people person' and seems comfortable talking with anyone, either in person or on the phone. He’s willing to go the extra mile and do whatever is needed. Just before Project Homeless Connect was held at Sonrise Church in Hillsboro, Grant made telephone calls to our entire client base to notify them of resources that would be available that day if they could get there. As a result, several of our clients were able to go and receive needed services. We praise God for sending Grant to us, and we thank Grant for his time and excellent service! On Thursday, November 3rd, a call came into the Love INC Clearinghouse. The first need was someone to interpret for this Spanish speaking family. Church #1 provided a bi-lingual volunteer. This family was in desperate need of a bed. An individual from Church #2 provided a box spring and mattress. Sheets and pillow cases were purchased by Church #3 and Church #4 donated a beautiful hand pieced quilt. What an amazing example of fulfilling Love INC's mission: to mobilize the church...in the name of Christ!